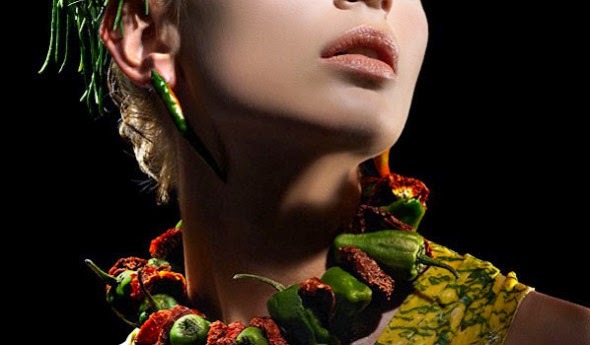 Wearable food: lo indosso o lo mangio? Oggi è tutto un proliferare di 'green' ed eco-sostenibile, e in qualsiasi parte del mondo veri e propri artisti, progettisti e stilisti si destreggiano tra frutta, verdura, legumi e altri prodotti biodegradabili per creare intere collezioni di abiti e accessori, allargando sempre di più l’offerta del cosiddetto 'wearable' food. Today everything is 'green', environmentally sustainable and, anywhere in the world are real artists, designers and stylists who are juggling between fruits, vegetables, legumes and other biodegradable products to create an entire collection of clothes and accessories, expanding more and more the offer of the so-called 'wearable' food. Una tra le prime artiste di fama internazionale che diede sfoggio del suo outfit “ecosostenibile” fu Lady Gaga che diede il via a passerelle ricche di stranezze da indossare. In occasione degli MTV Awards del 2010 esordì infatti con un abito fatto interamente di bistecche crude. One of the first international artists who gave a display of her "sustainable" outfit was Lady Gaga, who gave way of the oddities to wear. At the MTV Awards in 2010, she debuted with a dress made entirely of raw steaks. 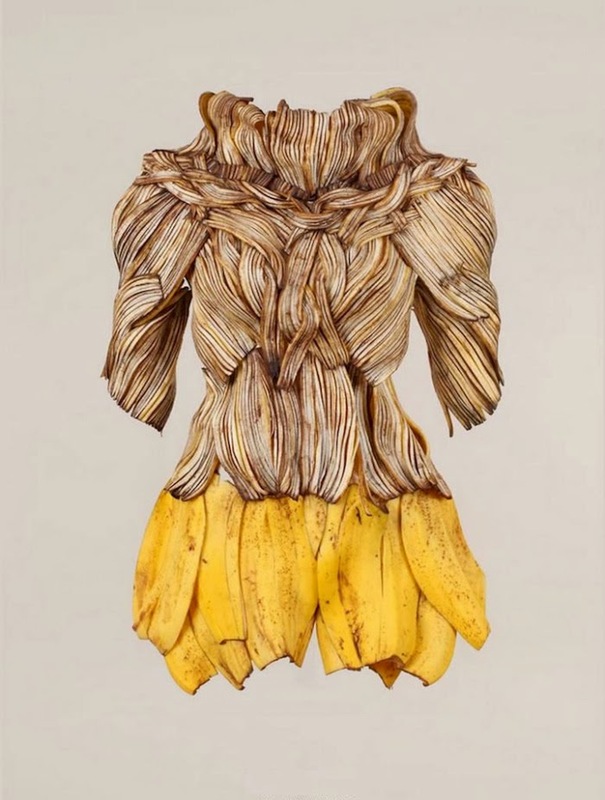 oppure la collezione particolare di wearable food ideata dalla cinese Sung Yeonju, famosa per i suoi vestiti fatti di gamberetti, cipolle e banane, per la serie "me lo mangio o me lo metto?" 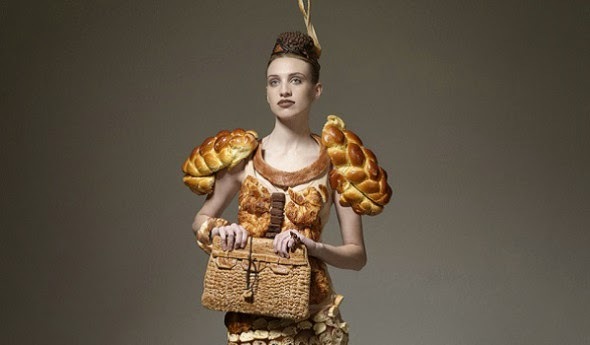 or the collection of special wearable food created by Sung Yeonju, from China, for the series "I eat it or I put it? ", who is famous for her clothes made of shrimp, onions and bananas. La food fashion ha incuriosito un po’ tutto il mondo, dando anche appetitosi spunti culinari - anche se il pubblico è forse ancora acerbo di fronte a tanta novità ...- . A quale scopo vestirsi di ortaggi, frutta e tuberi? Sarà davvero la rivoluzione del nuovo millennio? 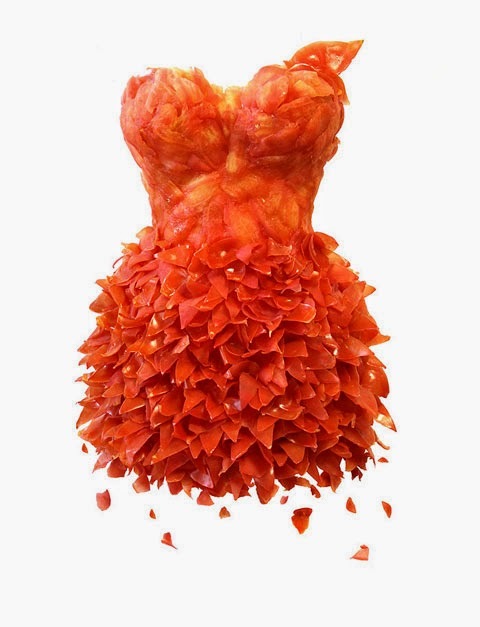 What is the purpose of dressing with vegetables, fruits and tubers? Will it really be the revolution of the new millennium? The British designer, Emily Crane's answer: "I believe that the materials we use today to produce clothes one day will end, and mass production will end too. 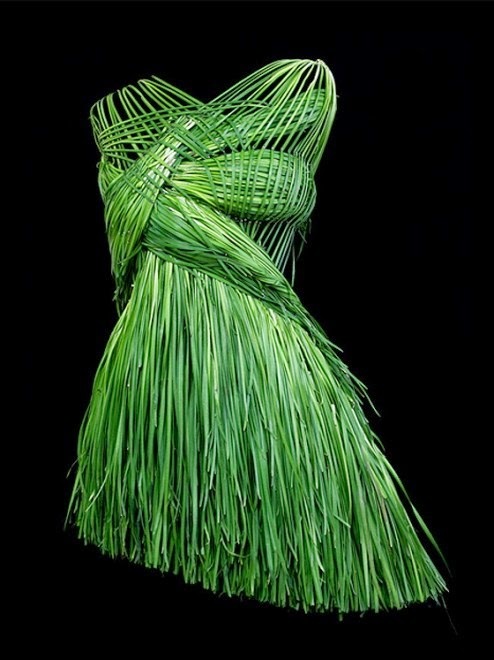 So the goal of 'fashion food' for me is to create a more sustainable way to make clothes. I hope that people can buy one day my recipes and create their own edible leaders." Seeing is believing...although perhaps, in this case, it would be more appropriate "try it to believe it!"